Heat oven to 350°F (325°F for dark or nonstick pans). Grease or spray bottoms only of two 8x4- or 9x5-inch loaf pans. In large bowl, beat cake mix, water, oil and eggs with electric mixer on low speed 30 seconds, then on medium speed 2 minutes, scraping bowl occasionally. Pour into pans. Bake yellow cake 28 to 36 minutes and devil's food cake 31 to 39 minutes or until toothpick inserted in center comes out clean. Cool 10 minutes. Run knife around sides of pans to loosen cakes; remove from pans to cooking racks. Cool completely, about 1 hour. For easier handling, refrigerate or freeze cake 30 to 60 minutes until firm. Meanwhile, divide vanilla frosting evenly among 4 small bowls; tint 1 bowl frosting red, 1 bowl frosting yellow,1 bowl frosting blue and 1 bowl frosting green with food colors. Spoon 1/2 cup chocolate frosting into resealable plastic bag; set aside. Using serrated knife, cut rounded top off each cake to level surface; place each cake cut side down. Cut first cake as shown in diagram to make engine, being careful not to cut all the way through piece 1 when removing piece 2. Place piece 2 on top of piece 1 as shown in diagram, with a small amount of frosting between pieces. Cut second cake into 4 equal pieces to make cars as shown in diagram. Spread thin layer of chocolate frosting over top and sides of engine to seal in crumbs. For each of the car cakes, spread thin layer of red, yellow, blue and green frosting over top and sides of each car to seal in crumbs. Refrigerate or freeze cakes 30 to 60 minutes or until frosting is set. Using chocolate frosting in resealable plastic bag, snip off small corner of bag. Pipe train tracks onto serving tray. Frost engine cake with remaining chocolate frosting. Frost boxcars with remaining colored frosting. Using large spatula, transfer cakes to serving tray. Cut pieces of licorice twist; place on front of engine, slanting outward, for the cow-catcher. Use licorice twist to add “trim” to the engine. Add gumdrops for engine “face” and chocolate candies for smoke stack. Top back of engine with crumbled cookies. Add gummy candy rings for wheels. Cut pieces of licorice twist to add “trim” to each of the cars. Add gummy candy rings for wheels. Top each car with assorted candies. Store loosely covered. Instead of baking the cake in two large loaves, you can use one 9-inch loaf pan and four miniature loaf pans, 4 1/2x2 3/4x1 1/4 inches each. Pour 1/2 cup batter into each mini loaf pan. Pour remaining batter into 9-inch loaf pan. Bake mini loaf pans 16 to 20 minutes; 9-inch loaf 28 to 33 minutes. Store any remaining frosting in the fridge to spread on graham crackers or cookies when you need a quick treat. 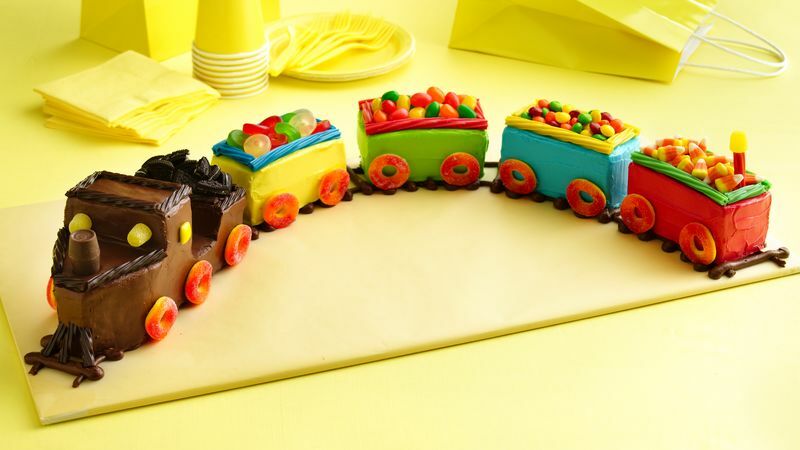 Get a party menu, prep guide, tips, party games, activities and more for a Train Birthday Party!